Guetzli it! Shrink your images online with Guetzli! Guetzli.it is an online JPEG compressor and optimizer based on Guetzli, a new groundbreaking perceptual encoder. Guetzli is capable of making JPEG files up to 150% smaller than the original. Guetzli is especially strong at encoding images with sharp edges and solid colors, which has always been one of the weakest points of the JPEG format. Google has released Guetzli's source files for everybody to use, in the hope that its adoption will make websites better and faster all over the internet. A zoomed example of jpg image encoded with Adobe Photoshop CS6 and with Guetzli. Notice how there are much less artifacts in the areas with sharp edges. The Guetzli image also takes slightly less disk space. Because Guetzli is extremely resource intensive, it is not trivial to install on a web server to optimize every incoming user file, or even to optimize template graphics. While the source code is freely available for everybody to build and use, it takes time to set it up and developing a proper system on a server is a job of its own. Guetzli it has already done it for you! Guetzli it provides a convenient web interface to drop your files and retrieve them once they have been encoded. It also provides an easy to use API to interact with your server. Plugins for popular CMS such as Wordpress and Magento are being developed and will soon be available as well. Of course! Guetzli it integrates seamlessly with your website or app! 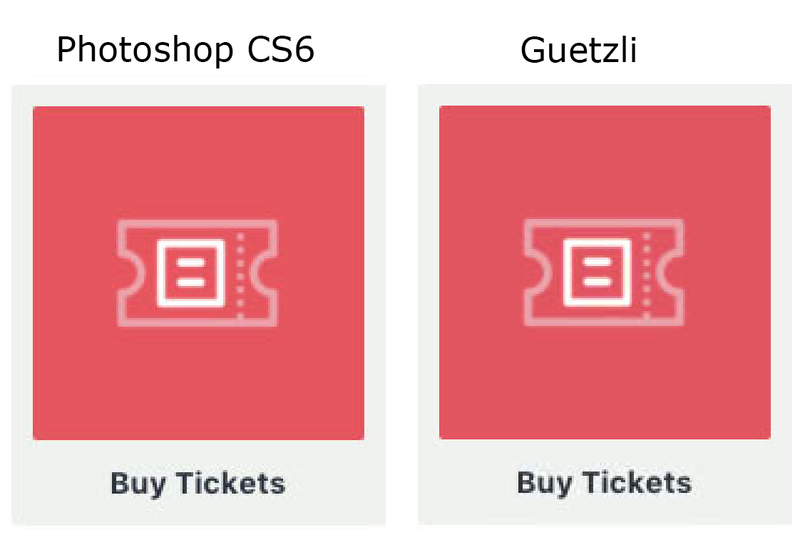 Through our convenient API, you can bring Guetzli's proven benefits to all of your website's images automatically. Your backend can just send us your images and we'll optimize them and send them back as soon as they're ready, in a completely transparent process which will keep your website light and snappy. Integrating Guetzli.it is extremely easy and cheap! Thanks to the Guetzli.it API you can also upload a single image file and generate multiple resolution optimized files, saving yourself the time to set this up by yourself in code. For more information on how to get Guetzli it integrated with your website, please check out the API documentation at https://guetzliit.docs.apiary.io and contact us here. Because of how the Guetzli algorithm works, Guetzli it provides plans based on the dimension in megapixels and not by file size. All accounts start with a free 10 megapixel quota. Should you need more, the current rate is $20 per gigapixel. Please contact us to purchase encoder credit. Guetzli it is currently in the Beta phase, so bugs are present and some features are still missing. We would like to keep in touch with you and inform you about the great news to come! Please let us have your e-mail, we will not misuse it, promised!